Badakhshan is my hometown, located between northeast Afghanistan and southeast Tajikistan. An ancient civilization once occupied my hometown but today it is a center of knowledge and culture, popular for its beauty and mines. This place is meaningful to me because it is where my forefathers grew up, where my roots lie, and where our people share a common past for all of their lives. This wonderful place makes me happy most of the time. Near our house we have a big river named Amo, which provides my town with its unique characteristics. The river is blue and the water is clear as a mirror and looks beautiful from far away. But when you are close up, the water on the shore sounds like the relaxing waves of the seashore. 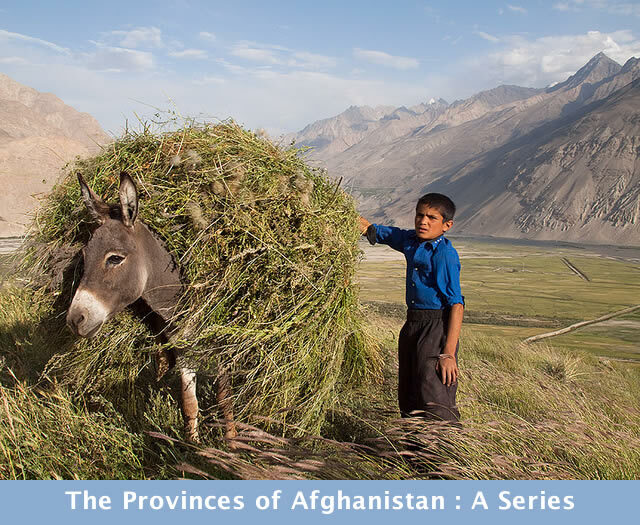 Between the river and our home is a beautiful field by the name of Tar, where the children play while women wash their clothes along the river, and the men play buzkashi, which translates to “goat grabbing.” This is a national sport of Afghanistan. In this game, the headless carcass of a goat is kept at the center of a field. Ten to twelve players from two opposing teams try to get hold of the carcass and carry it to the goal area. In the summer, this small village looks like paradise. Everywhere from the mountains to the fields is adorned with colorful yellow, red, and purple flowers. In this field listening to the wind and watching the leaves move brings us a feeling of happiness. The grass is very green and walking through the field you can feel how soft the grass is, and we can smell the blooming flowers. During the winter my village is still beautiful. All is covered with snow; it is as if the land wears white clothes. The flowers don’t bloom, but the fields are beautiful with snow. Badakhshan is filled with mines and most of the people in Badakhshan work in the mines. The mines make the area more independent because so much of the income comes from mining. Azure, garnet, gold, emerald, and ruby are the most popular minerals. The mountains are also very beautiful. Close up we can see the mining engineers with yellow hats that have big lights on top of them. We can see the dark hole on the mountain where the minerals are extracted. Sometimes for extraction of the azure the miners use machinery to make a small hole in the mountain and then they set up explosions to open up a part of the rock to break away the azure from other stones. Life in Badakhshan remained peaceful during several wars in Afghanistan, but these days the Taliban is attacking my hometown. Yet life remains simple. Living in a beautiful place gives people the feeling of happiness and comfort. Most of the women are happy. Although people don’t live a modern life, most are content with what they have. Some are busy with studying and working at their jobs. But men in my hometown support their wives, and many give their daughters an education so that most of the people in my hometown are educated. I wish for everyone to visit Badakhshan for a new understanding of Afghanistan. The information was very interesting and nice. Hoping for prosperity in Badakhshan, I hope one day I can visit there. We live in Turkey. My son’s name is Bada khan. I named him after his grandfather who are called Badalar, meaning the sons of Bada. There is also a peak called the Bada Khan on the Taurus mountains and a forest with the same name on that mountain. My theory is that the family of my father in law came from Badakshan from a Turkish tribe living there.